Name a missing piece in your life and design a package to contain it. I chose to package "Home Away From Home" for students and travelers to have no matter how far they roam. Fill the bag with personalized memorabilia and give it to your child or best friend as they leave for college. Each "Home Away From Home" is a reinforced and hand-embroidered paper lunch bag. Contents include a single spiced-apple-scented candle and list of recommendations for memorabilia. I began my research by brainstorming what I needed more of in my life. Because I experience a lot of stress, I gravitated towards calmness as something I could package and consume. I created a mind map around the word “calmness” and arrived at the word “mom” because my mom is a calming force in my life. I moved forward with the concept of packaging my mom and began to research the different forms the package could take. I liked the mood of the embroidered “Home Sweet Home” pillow, but wanted to avoid the cheesiness of the trope. I wanted something decorative and warm, yet quirky. I considered making a purse, a pillow, a totebag, and various lunch items like plastic baggies, Tupperware containers, and paper lunch bags. 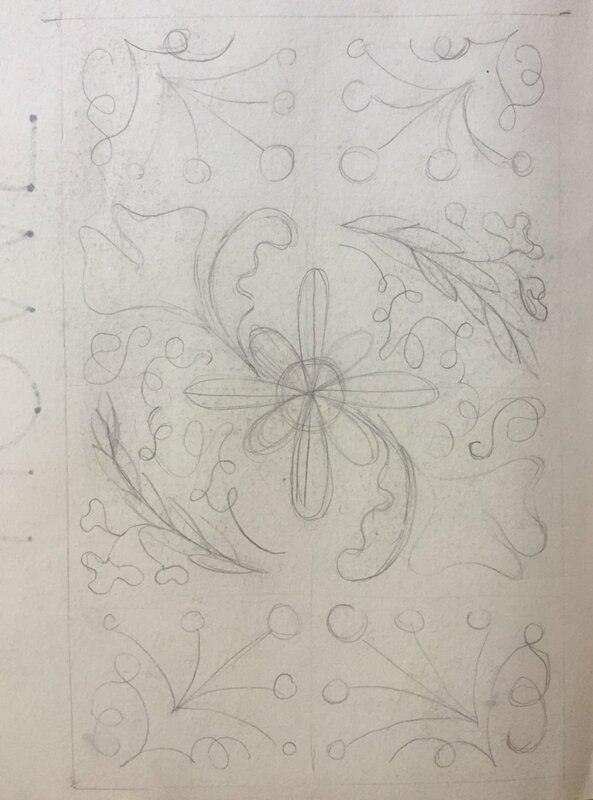 I pulled multiple examples of beadwork and needlework to use as references for my materials. When I moved forward with my “Mom in a Box” concept, I began to run into problems with the ambiguity of my idea. I wanted the package to encourage me, annoy me, push me, and yell at me all at once. I wanted something both cozy and satirical, but I was not sure how those moods merged. I also struggled with the fact that people have different relationships with their mothers, and my “Mom in a Box” wasn’t likely to resonate with many. When I looked back to my reasons for wanting to package my mother, I realized what I sought was a sense of comfort. I wanted to feel at home. Luckily, the materials I considered for “Mom in a Box” worked well with the concept of home. I proceeded with embroidery and needlework, but chose a paper lunch bag as the base material. There were many material questions that I needed to answer. Would I work with beads and thread, or just beads, or just thread? Would I employ all of the stitches I learned about online or just a few of them? How many colors would I use? Would I use the same colors and stitches for my typography and for my decorative patterns? Would I alter the structure of the paper bag to say different things depending on the fold? I experimented with my materials to find answers to all of these questions. I made several package mockups, each of them featuring a different folding structure. I also tried out different stitches and color combinations. From these explorations, I decided to limit myself to two main stitches, the backstitch and satin stitch. Occasionally I also used the French knot. I chose to limit myself to these stitches because I realized that together they fulfilled my stitching needs, and they reduced the likelihood that I would mess up my stitches or have a chaotic final product. I realized that the deep magenta I had chosen was too prominent and distracting in my decorative patterns, so I dedicated the magenta exclusively to my typography and the mint green exclusively to patterns. I chose to use the gold in moderation to call attention to details. After experimenting with the beads and thread, I realized the beads were more distracting than useful, and I decided not to incorporate them into my designs. I had to decide how to treat the typography on the bag. The imperfections of my materials (brittle paper bag, individual stitches) were a central component of my product’s appeal. I didn’t want to embrace these imperfections in the absence of rules for my treatment of type and space. Therefore, I planned and embroidered my type Bodoni and Brandon. The structure of these typefaces offered a nice contrast to my highly textured materials. Though the needlework was praised, the craft in other areas was criticized. The clasps used to hold the bag shut were taped onto the bag loosely, and the inside of the bag remained unlined, so all of my interior stitching was visible. These areas were not my focus for the critique, so they lacked that craft of my needlework. I agreed with the criticism and resolved to improve the craft of these components. This project solidified the benefit of placing limitations on myself. These limitations allowed me to explore a relatively new material and arrive at a result that still looked professional. I learned from my peers in critique that every component of the product needs to be considered and well-crafted in order for the piece as a whole to succeed. I learned from my professor the benefit of considering the product in the real world: Who would buy it and why? How would they use it? Asking myself these questions allowed me to make a product that was relevant and useful.